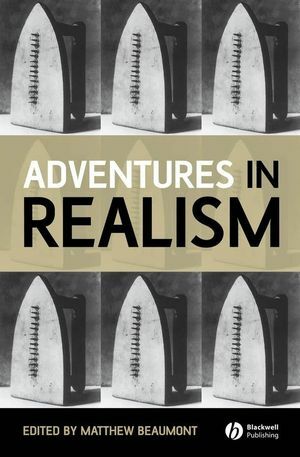 Adventures in Realism offers an accessible introduction to realism as it has evolved since the 19th century. Though focused on literature and literary theory, the significance of technology and the visual arts is also addressed. Foreword by Rachel Bowlby (University College London). Introduction: Reclaiming Realism: Matthew Beaumont (University College London). 1. Literary Realism Reconsidered: “The world in its length and breadth”: George Levine (Rutgers University). 2. Realist Synthesis in the Nineteenth Century Novel: “That unity which lies in the selection of our keenest consciousness”: Simon Dentith (University of Gloucestershire). 3. Space, Mobility, and the Novel: “The spirit of place is a great reality”: Josephine McDonagh (Oxford University). 4. Naturalism: “Dirt and horror pure and simple”: Sally Ledger (Birkbeck College, University of. 5. Realism before and after Photography: “The fantastical form of a relation among things”: Nancy Armstrong (Brown University). 6. The Realist Aesthetic in Painting: “Serious and committed, ironic and brutal, sincere and full of poetry”: Andrew Hemingway (University College London). 7. Interrupted Dialogues of Realism and Modernism: “The fact of new forms of life, already born and active”: Esther Leslie (Birkbeck College, University of London). 8. Socialist Realism: “To depict reality in its revolutionary development”: Brandon Taylor (University of Southampton). 9. Realism, Modernism, and Photography: “At last, at last the mask has been torn away’”: John Roberts (University of Wolverhampton). 10. Cinematic Realism: “A recreation of the world in its own image”: Laura Marcus (University of Sussex). 11. The Current of Critical Irrealism: “A moonlit enchanted night”: Michael Löwy (National Center for Scientific Research, Paris and École des Hautes Études en Sciences Sociales, Paris). 12. Psychoanalysis and the Lacanian Real: “Strange shapes of the unwarped primal world”: Slavoj Žižek (University of Ljubljana and Birkbeck College, University of London). 13. Feminist Theory and the Return of the Real: “What we really want most out of realism …”: Helen Small (Pembroke College, Oxford). 14. Realism and Anti-Realism in Contemporary Philosophy: “What’s truth got to do with it?”: Christopher Norris (Cardiff University). 15. A Note on Literary Realism in Conclusion: Fredric Jameson (Duke University). "Adventures in Realism is an exciting and necessary book. It collects together a stunning array of essays that, both individually and as a whole, show why we need to consider the nature and importance of realism. The volume encourages us to think through the concept both in relation to its mid-nineteenth century origins, and today’s philosophical discussions; to see it both as manifested in specific literary or artistic forms and as a more abstract way of figuring our place within the material world. Matthew Beaumont should be congratulated in placing his contributors into such effective dialogue with one another: in doing so, he has returned realism to the center of historical, aesthetic, and political debate." "Every new generation of critics and scholars must come to terms in its own ways with the paradoxes of realism. Realism is a period style, but at the same time it is a perennial motive in literature, art, film, and other media. Realism purports to represent things as they are, or were, but at the same time it is a constitutive set of conventions that tells people in a given time and place what is to be taken as real. This distinguished collection of essays brilliantly articulates these paradoxes for our own time." "What a wonderfully wide and deep and pushing inspection of realisms (and irrealisms) in history, in theory, in practice. Here’s realism, then and now, cannily philosophized, politicized, feminized, psychologized. Here are so many of realism’s practitioners, its aesthetic friends and enemies, the missionaries and also the scoffers, being heard and watched as they engage with their chosen media – novels, plays, paintings, photographs, films, buildings. It is, I think, as serious, engaging, educating a look at the large realist project as could well be assembled."